DogTober is coming! 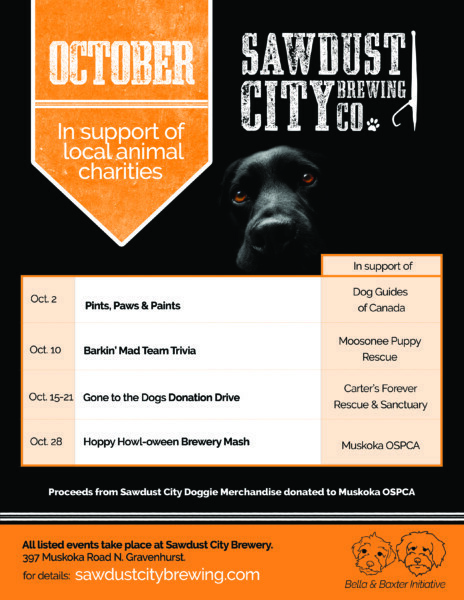 Sawdust City Brewing Co. in Gravenhurst will be supporting dogs through various events. 15-21 October is Gone To The Dogs Donation drive and is in support of Carter’s Rescue. Donations can be made at the brewery in Gravenhurst and our wish list includes Martingale Collars, linens, bully sticks and always welcome cash donations. Come out and sample some great local brews and help support our dog friends!